Objective: Previously we reported on the increased risk of adverse neurodevelopmental outcomes in children exposed in utero to hyperemesis gravidarum. The purpose of this study is to determine the frequency of non-neurodevelopmental long-term health effects in children exposed in utero to hyperemesis gravidarum and to identify prognostic factors for these disorders. Study design: Long-term outcomes of 312 children from 203 mothers with hyperemesis gravidarum were compared to outcomes from 169 children from 89 unaffected mothers. The clinical profiles of patients having a child with an adverse outcome were then compared to the clinical profiles of patients having a child with a normal outcome to identify prognostic factors. Proportion tests were used to compare outcomes between variables with binary responses. Continuous responses were analyzed using a t-test. Results: Children exposed in utero to hyperemesis gravidarum have a 3.82-fold increase in odds of being diagnosed with a long-term health effect including allergies, chronic constipation, gastroesophageal reflux disease, growth restriction (height and weight below 20th percentile), lactose intolerance, chronic respiratory or ear infections, or sleep difficulties (p< 0.0005). Among hyperemesis gravidarum patients, women who took promethazine during pregnancy or began gaining weight later in their pregnancy (after 20 weeks) were more likely to have a child that was diagnosed with allergies (p=0.037 for promethazine and p=0.004 for late weight gain). Those who took antidepressants while pregnant were more likely to have a child with chronic constipation (p=0.029). Metoclopramide use during pregnancy was protective against having a child diagnosed with gastroesophageal reflux disease (p=0.014). Preterm delivery was significantly linked to growth restriction in a child (p=0.003). Both herbal medicine and homeopathics were also significantly linked to growth restriction (p=0.006 for herbal medicine and p=0.001 for homeopathics), as well as to sleep difficulties (p=0.017for herbal medicine and p=0.013 for homeopathics). Peripherally inserted central catheter and Dolasetron use were linked to having a child with respiratory or ear infections (p=0.006 for PICC and p=0.038 for Dolasetron). Conclusion: Women with hyperemesis gravidarum are at a significantly higher risk of having a child with long-term health effects. This study demonstrates the need for further analyses to address whether hyperemesis gravidarum itself or certain herbal and prescribed medications taken during pregnancy are responsible for the increased risk. Hyperemesis Gravidarum is defined as persistent and debilitating nausea and vomiting during pregnancy that results in more than a 5% body weight loss, abnormal fluid and nutritional intake, electrolyte imbalance, dehydration, and ketonuria.Symptoms often extend beyond the first trimester and can last throughout the entire pregnancy in as many as one-third of cases, leading to extreme weight loss and a state of malnutrition with prolonged dehydration during pregnancy. Hyperemesis Gravidarum (HG) is associated with over 285,000 admissions/hospitalizations in the U.S. annually .Estimates of severe Nausea and Vomiting of Pregnancy (NVP) vary greatly and range from 0.3% in a Swedish registry to as high as 10.8% in a Chinese registry of pregnant women, with most authors reporting an incidence of approximately 0.5%[4-6]. HG can be associated with serious maternal and fetal morbidity such as Wernicke’s encephalopathy,fetal growth restriction, and even maternal and fetal death[8,9]. Published data has demonstrated perinatal complications associated with HG. Two systematic reviews showed HG is significantly associated with low birth weight, small for gestational age infants, and preterm birth[10,11].There is less information, however, on outcomes of children exposed to HG in utero[12,13].Previously, we found a 3.6-fold increased risk of neurodevelopmental disorders in adults exposed to HG in utero [14,15].In a more recent study we found that children exposed to HG in utero show a 3.28-fold increase in odds of having a neurodevelopmental diagnosis including attention disorders, learning delay, sensory disorders, and speech and language delay .Herein, we determine the risk for non-neurodevelopmental long-term health effects in children from well-defined cases of HG compared to well-defined controls. Factors including pregnancy characteristics, treatments, and medications taken during pregnancy were also evaluated for having any association with adverse outcomes in children exposed to HG in utero. This study is part of a larger investigation evaluating the genetics and epidemiology of HG. Eligible patients were recruited through the Hyperemesis Education and Research Foundation (HER Foundation) web site at www.HelpHer.org beginning in 2007. Each potential participant was asked a series of eligibility questions. They were included in the study if they 1) were currently living in the United States, 2) had severe nausea and vomiting in a singleton pregnancy, 3) were treated with Intravenous (IV) Fluids and/or Total Parenteral Nutrition (TPN) or other form of feeding tube in the pregnancy due to nausea and vomiting, and 4) were between 18 and 50 years-old. Each participant was asked to submit a medical record of HG diagnosis and IV fluid treatment/tube feeding if available. However, a submitted medical record was not required to participate in the study. Each case was asked to recruit an acquaintance with at least two pregnancies to participate as a control. If a case was unable to successfully recruit a control or the control did not complete the study or update their contact information for follow-up, the case was still included in the study. Controls were eligible if they experienced either no NVP or normal NVP that did not interfere with their daily routine, they did not have any weight loss due to NVP, and they did not require medical attention in any pregnancy due to NVP. To ensure outcomes amongst subjects were independent of one another, relatives of participants in the study were not included. Minors (under 18 years old) were excluded because few teens are expected to fit the study criteria for controls having had two pregnancies. Multiple gestations and pregnancies complicated by a chromosome abnormality were also excluded because each may be associated with HG due to unique physiological pathways. Participants who have no children were excluded because child outcomes were the focus of this study. There were 203 HG patients and 89 control patients enrolled in the study. This study was approved by the Institutional Review Board at University of California at Los Angeles, IRB # 09-08-122-01A. Participants with HG submitted medical records and completed an online survey to obtain information regarding demographics, pre-existing medical conditions, family history, pregnancy symptoms, medication use, and maternal, fetal, and child outcomes .Low Socioeconomic Status (SES) was defined as anything below a household income of $35k. Medium SES included a household income between $35k and $75k, while high SES was an income above $75k. The sites http://zipwho.com/ and http://www.zipdatamaps.com/ were used to estimate yearly household income based on zip code.In 2013, participants who met the study criteria were administered a follow-up survey to report on the diagnosis of childhood long-term health outcomes. Childhood outcomes of interest were determined by a diagnosis made by a medical professional and reported by the mother in the survey. There were 203 HG patients reporting on the physical outcomes of 312 children exposed to HG in utero and 89 control participants reporting on 169 children not exposed to HG in utero (Figure 1). Figure 1. Schematic of study participants. 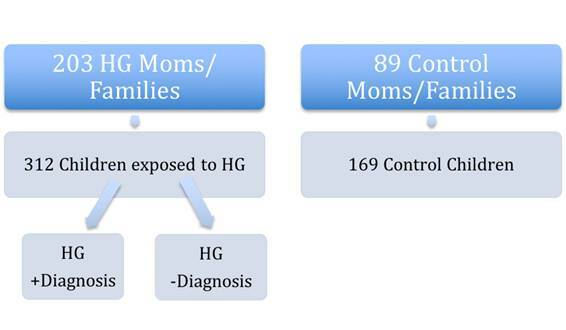 A) 203 women with HG (HG Moms/Families) reported on diagnoses in B) their 312 children exposed to HG in utero. These women were compared to A) 89 women who did not have HG in their pregnancies (Control Moms/Families) who reported on B) diagnoses in their 169 children who were NOT exposed to HG in utero (Control children). C) Then children exposed in utero to HG who had a significant diagnosis (eg. Allergies) were compared to children exposed in utero to HG who did not have that particular diagnosis (ie No Allergies). Maternal and child characteristics were compared between children who were exposed to HG in utero and those who were not (Table 1). To account for genetic or familial traits, individual variables would only be counted once per family. To evaluate differences amongst the groups, proportion tests were conducted for categorical variables and t-tests were used for numerical variables. Logistic regression was performed in order to derive estimated odds ratios and confidence intervals corresponding to various diagnoses found in families (Table 2). Table 2. Increased risk of adverse physical outcomes (diagnosis in at least one child reported per family) in children exposed to HG. In children exposed to HG in utero, pregnancy characteristics, hospitalization data, preterm birth, treatments, and medications taken during pregnancy were compared between those who had a child with a long-term health effect versus those who had a healthy child outcome (Figure 1C, Table 3). Within the HG group, we examined potential factors linked to adverse outcomes such as treatments and medications received during pregnancy, NVP characteristics, and preterm births. To see if a treatment, medication, or symptom affected the probability of having a child with an adverse outcome, a proportion test on the presence of each long-term effect was performed. Table 3. Medications and treatments significantly associated with specific childhood diagnosis. Cases and controls were matched for mean maternal age, race, Socioeconomic Status (SES), spontaneous labor, delivery method, and use of assisted reproduction (Table 1). The children of both groups were also matched for gender and age, with the average age being between 8 and 9 years old. HG patients tended to have fewer children (1.54 on average for cases with HG compared to 1.9 for the control group; p=0.0015) and were more likely to have a child born before 37 weeks (p=0.0502). HG patients were significantly more likely to report a child that had a diagnosis of allergies (p=0.02), chronic constipation (p=0.0116), gastroesophageal reflux/acid reflux disease (p=0.0007), growth restriction (p=0.0273), lactose intolerance (p=0.0178), chronic respiratory or ear infections (p=0.0322), or chronic sleep difficulty (p=0.0023) in at least one of their children (Table 2). There were no significant differences in the reported rates of other non-neurodevelopmental issues between the cases and controls. Preterm birth, though not statistically significant (p = 0.07), was more common among HG families. Overall, 84% of HG patients reported at least one child with a long-term health effect, compared to 57% of women without HG. This corresponds to a combined 3.82-fold increase in odds of having a child diagnosed with an adverse physical condition from pregnancies complicated by HG (OR 3.82, 95% CI = [2.20, 6.77]). The maternal pregnancy characteristics that were found to be significantly associated with each childhood diagnosis are shown in Table 3. Later maternal pregnancy weight gain was significantly associated with having a child diagnosed with allergies (p=.004), preterm birth was significantly associated with having a child with growth retardation (p=.003), and herbal medicine and homeopathics were significantly associated with having a child with chronic sleep difficulties (p=.017, p=.013). Finally, maternal weight gain beginning after 20 weeks gestation was significantly associated with having at least one of the significant adverse outcomes when compared to children with none of the significant adverse outcomes listed in Table 3. Thirty-seven different treatments and medications were explored for possible links to individual adverse outcomes. Our sample included 232 children that were exposed to HG with a long-term health effect and 80 children who were exposed to HG with a good outcome. Only the medications and treatments that were found to be significantly associated with specific childhood diagnoses are shown in Table 3. This study focuses on the most extreme end of NVP in which symptoms are prolonged and intractable. Women affected with HG show a 3.82-fold increase in odds of having a child diagnosed with an adverse physical outcome later in life. Failure to gain enough weight during pregnancy puts the child at risk for intrauterine growth restriction, which then may put the child at greater risk for other neurodevelopmental and physical problems later in life compared to infants of normal weight. Our data supports this, showing that HG mothers have a 3.14-fold increase in odds of having a child who suffers from growth failure. The specific mechanism linking exposure to HG and abnormal physical development is unknown, however several studies have shown significant associations between HG and physical developmental problems in children. Higher rates of undescended testicles and hip dysplasia were reported as associated with HG according to a cohort study done in Sweden.In utero, vitamin D deficiency has recently been linked to an increased risk of asthma, allergy, and acute lower respiratory infections in early childhood[20,21].Neonatal vitamin A deficiency has been associated with an increased risk of ear and respiratory infections .Herbal medicine was found to be linked to higher rates of growth failure and chronic sleep difficulties in our study, and some herbal medicines, specifically huanglian and An-Tai-Yin, have been found to be significantly associated with congenital malformations . In more than a quarter of HG pregnancies, patients experience at least a 15% loss in body weight, and HG symptoms persist until the end of the pregnancy in over 20% of cases. This lack of nutrition and hydration suggests HG can be a form of prolonged starvation.The Dutch Famine of 1944 demonstrated the detrimental effects of prenatal exposure to undernutrition. The Dutch Famine Birth Cohort Study not only found that the children whose mothers were pregnant during the famine were at higher risk for health problems, but the children of these children were thought to be smaller than average, suggesting a possible epigenetic characteristic was passed down to the next generation . There are limitations to the study. Participants were not assessed for common factors associated with adverse or delayed physical outcomes such as maternal smoking, alcohol consumption, and recreational drug use during pregnancy[25,26].However, given that maternal smoking is inversely associated with HG, if cases and controls were not well matched for these characteristics, the results would likely bias toward the null. An online survey was used to collect data for this study. Medical diagnoses were reported by the mother and there was no review of the child’s medical records. Inaccuracies in the diagnoses are a possibility and there is also the potential for recall bias. However, rates of diagnoses in our control population are consistent with rates reported in the published literature. In our sample 35.96% of control mothers reported that at least one of their children had allergies. According to the American Academy of Allergy, Asthma, and Immunology the population proportion of school children who are reactive to common allergens is approximately 40% .In March 2015 the American Academy of Otolaryngology reported an estimated 5-8% of adolescent children have GERD, which is consistent with the 7.87% of our controls that reported at least one child with GERD . Our small sample size is also another limitation. We examined as a response variable the collection of all significant adverse outcomes in order to search for potential predictors and found significantly higher rates of adverse physical outcomes amongst those who took anti-motion medications, had IV fluid treatment, were home health care patients, and began gaining weight after week 20. However, for particular individual response variables, especially rarely observed outcomes such as chronic sleep difficulties or chronic constipation, our study may have insufficient power to detect significant predictors. Further, in this study we performed numerous simultaneous tests in order to investigate potential links between HG and associated treatments with a variety of outcomes. We reported individual p-values and these should be interpreted qualitatively as summaries of the strength of the observed correlation, but further study is needed to determine if these associations definitively exist in the overall population. In addition, we certainly cannot infer causal links between treatments and adverse consequences based on the observed associations from this observational study. One of the strengths of this study comes from the long-standing collaboration with the HER Foundation that provided a unique opportunity to involve a large group of women affected with HG to contribute important data. In addition, the design allowed for a significantly well-matched study sample. By limiting the second part of our analysis to HG patients only, we were able to control for potential confounding factors contributing to HG that could possibly also contribute to adverse child outcomes. In addition, our finding that preterm birth is linked to childhood growth retardation, which is already a well-known predictor of poor child growth, suggests at least some of the novel associations identified in this study are likely to be validated with further study. Adverse physical outcomes are significantly associated with children who were exposed to HG in utero. This suggests that such exposure could have long-term effects on a child. The cause for the association is unknown, but may be related to certain medications/treatments, maternal stress, abnormal hormone levels during fetal development, malnutrition, or vitamin deficiency. HG is an under-studied and under-treated condition of pregnancy that not only results in maternal physical and mental health problems, but also potentially results in long term physical and mental health consequences to the exposed fetus. Jiang HG, Elixhauser A, Nicholas J, SteinerC, Reyes C, et al. (2002) Care of women in US hospitals, 2000: HCUP fact book no. 3, no. 02-0044. Rockville, MD: Agency for Healthcare Research and Quality; 2002. ©2016 Fejzo MS. This is an open-access article distributed under the terms of the Creative Commons Attribution License, which permits unrestricted use, distribution, and reproduction in any medium, provided the original author and source are credited.